In the first of a two part series on Collooney, the Weekender in the community speaks to the local Tidy Towns, people involved in Community Games, a new restaurateur in the area and the Couch 2 5k program. Here is a taster of the two page feature in this week’s paper. Also, check out next week’s edition (June 2) for more stories from Collooney. THE TidyTowns initiative has encouraged towns around the the country to tackle problems in their community including litter and dilapidated buildings. 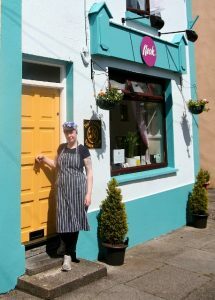 NEW BUSINESS: Ethna Reynolds outside here new business ‘Nook’ in Collooney. Her story is in this week’s edition of the Sligo Weekender. Among the Sligo areas making great strides in recent years is Collooney, who have been steadily climbing the annual rankings. The TidyTowns committee in Collooney is headed by Daniel Gallagher who is eager to get more residents involved in the group. “I have been involved in the Tidy Towns group for around three years now. We have been taking part in the Tidy Towns competition for 16 years, it is very community based and we want to get more people out and getting involved,” he said. Daniel is pleased with their progress but he has stressed that there is much more work than can be done to enhance the area. One such project has been the renovation of the listed Inishfree Crystal building which had been considered an “eyesore” for a numbers of years. Local children have also been praised for their increased anti-litter efforts in keeping their school and play areas clean. Daniel once again emphasised his desire to see more members join the group and explained how anyone interested in joining can begin their work closer to home if they wish. Anyone seeking further information can e-mail collooneytidytowns12@gmail.com.